Location of United Arab Emirates. Source: Wikipedia Commons. Since gaining independence from the United Kingdom and uniting in 1971, the United Arab Emirates (UAE)—a federation of the seven emirates of Abu Dhabi, Ajman, Al Fujairah, Dubai, Ras al Khaymah, Sharjah, and Umm al Qaywayn—has relied on its large oil and natural gas resources to support its economy. The UAE is currently the seventh-largest petroleum producer in the world, and hydrocarbon export revenues are projected to account for $65 billion in 2017, roughly 20% of all export revenue. The share of hydrocarbon export revenues, which amounted to $129 billion (35% of total export revenue), has fallen since 2013 according to the International Monetary Fund (IMF) as a result of the decline in oil prices.1 Nonetheless, UAE’s crude oil and other petroleum liquids production has grown over the same period. A member of the Organization of the Petroleum Exporting Countries (OPEC) since 1967—when Abu Dhabi joined—the UAE is one of the most significant oil producers in the world. The likelihood of further major oil discoveries is low, but the UAE uses enhanced oil recovery (EOR) techniques to increase the extraction rates of the country’s mature oil fields. 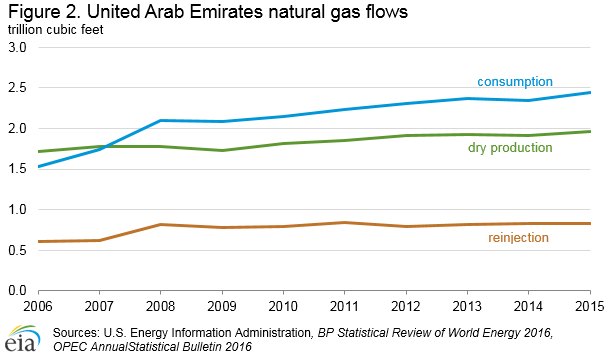 Natural gas use in the UAE is rising. Although the country is a member of the Gas Exporting Countries Forum (GECF), domestic demand is likely to draw heavily from the UAE’s natural gas resources. Currently, the country both imports and exports liquefied natural gas (LNG) and shares international natural gas pipelines with Qatar and Oman. The UAE is also one of the world leaders in the use of natural gas in EOR techniques. With natural gas demand rising, the UAE plans to expand domestic natural gas production by applying EOR techniques to gas wells. The UAE is making notable progress in diversifying its economy through tourism, trade, and manufacturing. However, in the near term, oil, natural gas, and associated industries will continue to account for most of the economic activity in the seven emirates. Each of the seven emirates is responsible for regulating the oil industry within its borders, creating a mix of production-sharing arrangements and service contracts. In Abu Dhabi, the Supreme Petroleum Council (SPC) sets Abu Dhabi’s petroleum-related objectives and policies. Given Abu Dhabi’s dominance among the seven emirates in UAE’s oil industry, the SPC is the most important entity in the country for establishing oil policy. The Abu Dhabi National Oil Company (ADNOC)—which operates more than two dozen subsidiaries and institutions throughout the oil, natural gas, and petrochemical sectors—leads the day-to-day operations and implementation of SPC directives, and it is the key shareholder in nearly all upstream activity in Abu Dhabi.3 ADNOC’s subsidiaries engage in oil and natural gas exploration, processing, and distribution, among other activities. Some of the most notable subsidiaries are the Abu Dhabi Company for Onshore Oil Operations (ADCO), the Abu Dhabi Marine Operating Company (ADMA-OPCO), the Zakum Development Company (ZADCO), and the Abu Dhabi National Tanker Company (ADNATCO), which operates under the same management team as the National Gas Shipping Company (NGSCO). Natural gas production and regulation are the responsibilities of the individual Emirates and are often carried out under the same leadership as their oil sectors. ADNOC leads Abu Dhabi’s natural gas sector through its subsidiaries, and the exploration and production of natural gas resources, as is true for its oil, is carried out by ADCO and ADMA-OPCO. The Abu Dhabi Gas Industries Limited Company (GASCO), created as a joint venture between ADNOC, Shell, Total, and Partex, oversees processing of Abu Dhabi’s natural gas liquids (NGL), and the associated gas recovered from onshore oil operations. Another important company in Abu Dhabi’s natural gas sector is Abu Dhabi Gas Liquefaction Limited (ADGAS), which controls the production and export of Abu Dhabi’s LNG and liquefied petroleum gas (LPG). The third major participant in Abu Dhabi’s natural gas industry is the Abu Dhabi Gas Development Company Limited (Al Hosn Gas), which develops the sour gas reservoirs in the Emirate’s large Shah field. Al Hosn Gas is a joint venture between ADNOC and Occidental Petroleum Company. The DSCE is also the central figure in Dubai’s natural gas sector. Led by the ENOC group—a state-owned entity made up of dozens of subsidiaries—Dubai’s natural gas sector operates similarly to its counterpart in Abu Dhabi. The Dubai Natural Gas Company Limited (DUGAS) oversees engineering, construction, management, and operation of Dubai’s natural gas infrastructure. ContractsAbu Dhabi bases contract structures on long-term, production-sharing agreements (PSAs) between the state-run ADNOC and private actors (primarily large international oil companies), with the state holding a majority share in all projects. With the exceptions of Dubai and Sharjah—which have service contracts to manage their declining reserves—the smaller Emirates all use PSAs similar to those found in Abu Dhabi. The UAE is a major oil producer and exporter. In 2016, the country produced an average of nearly 3.7 million barrels per day of petroleum and other liquids, the seventh-highest total in the world. Recent exploration in the UAE has not yielded any significant discoveries of crude oil. What the UAE lacks in new discoveries, it makes up for with an emphasis on EOR techniques designed to extend the lifespan of the Emirates’ existing oil fields. By improving the recovery rates at the existing fields, such techniques helped the UAE to nearly double the proved reserves in Abu Dhabi over the past decade. The UAE was the fourth-largest producer of petroleum and other liquids among OPEC members in 2015. The country has an ambitious target of increasing crude oil production to 3.5 million b/d by 2020, despite lower oil prices. The UAE produced 3.7 million barrels per day (b/d) of petroleum and other liquids in 2016, of which 2.9 million b/d was crude oil and the remainder was non-crude liquids (condensate, natural gas plant liquids, and refinery processing gain). The UAE has the fourth-highest petroleum production in OPEC behind Saudi Arabia, Iraq, and Iran (Figure 1). The UAE plans to increase crude oil production to 3.5 million b/d in 2020,17 but with limited prospects for major discoveries, production increases in the UAE will come almost exclusively by using EOR techniques in Abu Dhabi’s existing oil fields. One potential source of output growth is the Zakum petroleum system. ZADCO—owned jointly by ADNOC (60%), ExxonMobil, (28%) and the Japan Oil Development Company (12%)—manages production from UAE’s Upper Zakum field, which currently produces about 670,000 b/d.18 In July 2012, ZADCO awarded an $800 million engineering, procurement, and construction contract to Abu Dhabi’s National Petroleum Construction Company—along with the French firm, Technip to expand oil production at the Upper Zakum field to 750,000 b/d by 2018 and to 1 million b/d by 2024.19 To meet this target, ZADCO shareholders have employed an artificial island concept with extended-reach drilling (ERD) and maximum reservoir contact (MRC) technology.20 Production from the Lower Zakum field—operated by the Abu Dhabi Marine Operating Company (ADMA-OPCO)—should also increase to 425,000 b/d from the 345,000 b/d it currently produces. The UAE has one of the highest rates of per capita petroleum consumption in the world. The UAE is both a major exporter and a consumer of petroleum liquids. The U.S. Energy Information Administration (EIA) estimates that the UAE exported more than 2.5 million b/d of crude oil in 2016, with most of it going to markets in Asia (Table 2). In addition to being a major global petroleum exporter, the UAE domestic market relies heavily on petroleum product imports to meet energy demand. Most of the UAE’s petroleum imports are residual fuel oil, with limited imports of motor gasoline and diesel fuel. The UAE has a well-developed domestic pipeline network that links oil fields with processing plants and export terminals. The newest export pipeline, the Abu Dhabi Crude Oil Pipeline (ADCOP), runs 236 miles from Habshan to Fujairah and began operations in June 2012. This pipeline gives the UAE a direct link from the rich fields of its western desert to the Gulf of Oman and from there to global markets. With a capacity of 1.5 million b/d—and a potential capacity of 1.8 million b/d—this pipeline allows the UAE to export a significant portion of its daily production without passing through the Strait of Hormuz. The Strait of Hormuz is the world’s busiest energy chokepoint (*link to Chokepoints CAB*), accounting for 30% of all seaborne-traded oil. Already the world’s second-largest bunkering port, the export terminal in Fujairah will expand its storage capabilities significantly over the coming years. Plans to expand the terminal include several new private tank storage units, with an anticipated capacity of 88 million barrels by 2020. The Fujairah port also opened the country’s first very large crude carrier (VLCC) in September 2016, bringing total port loading and unloading capacity to 2 million b/d.21 Refining and storage capacity are growing as a result of ongoing expansion projects, and Fujairah is quickly becoming a critical node in a well-developed refining and export network. The UAE and neighboring Oman plan to build a jointly-operated refinery in the Duqum special economic zone that would have a capacity of 230,000 bbl/d by 2018. DSCE also signed a memorandum of understanding (MOU) with China Sonangol to build a refinery in Dubai, but capacity and schedules have not been released. The UAE plans to boost domestic natural gas production over the next several years to help meet growing internal demand. Much of the growth could come from the country’s large sour (high-sulfur) gas deposits. The UAE holds the seventh-largest proved reserves of natural gas in the world, at slightly more than 215 trillion cubic feet (Tcf) (Table 4). 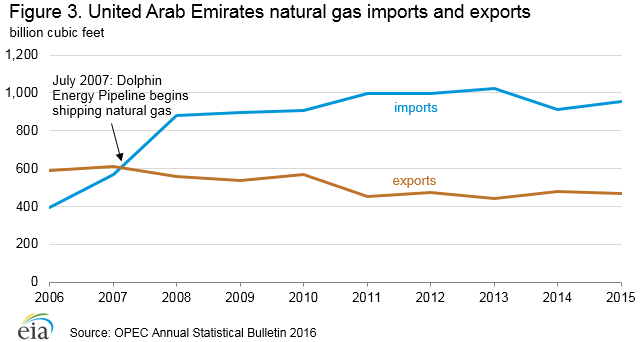 Despite its large endowment, the UAE became a net importer of natural gas in 2008. 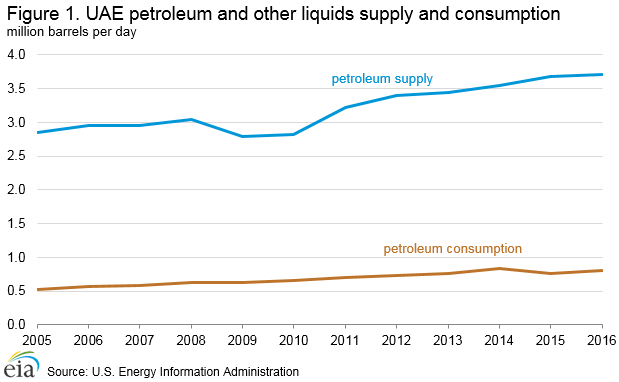 This phenomenon is a result of two things: (1) the UAE reinjected approximately 26% of gross natural gas production in 201524 into its oil fields as part of EOR techniques and (2) the country’s rapidly-expanding electricity grid—already strained by the swift economic and demographic growth of recent decades—relies on electricity from natural gas—fired facilities. The UAE’s natural gas has a relatively high sulfur content that makes it highly corrosive and difficult to process. For decades, the country simply flared the natural gas from its oil fields rather than undertake the extensive—and expensive—processes associated with separating the sulfur from the natural gas. The technical difficulties of producing the country’s sulfur—rich (sour) natural gas once posed a great impediment to the development of the UAE’s reserves, but advances in technology and the growing domestic demand for natural gas make the country’s vast reserves an enticing alternative to Qatari imports. Already a natural gas producer, the UAE has several ongoing projects that could bring additional natural gas supplies online to help satisfy rapidly growing demand. However, developing additional gas resources is costly. Natural gas production in the UAE rose to roughly 2 trillion cubic feet (Tcf) in 2015, continuing the upward trend that began in the late 1970s (Figure 2).26 Despite the challenges of producing natural gas domestically, the UAE hopes to further boost production to help meet the country’s growing demand. Several ongoing projects—the Onshore Gas Development (OGD), Integrated Gas Development (IGD), and Offshore Associated Gas (OAG) projects—may increase production of the country’s natural gas reserves and could help meet UAE’s rapidly growing demand for natural gas. ADNOC is pursuing a large—scale sour-gas development at the Shah field. One of the project’s challenges is that producing the ultra-sour natural gas yields relatively small quantities of marketable natural gas; in this case, just 504 cubic feet per 1,000 cubic feet of marketable gas is produced, even after extensive treatment. The Shah natural gas field production project came online in January 2015 and reached full capacity in October 2015. It produced 504 million cubic feet per day (MMcf/d) of dry natural gas and 50,000 b/d of natural gas liquids from 1 Bcf of gross production. The UAE was the first country in the Middle East to export liquefied natural gas (LNG) and has exported more than 268 billion cubic feet of LNG annually, almost exclusively to Asia, in 2015. ExportsIn 1977, the UAE became the first country in the Middle East to export LNG, sending its first load to the Tokyo Power Company (TEPCO) as part of a long-term supply agreement. The UAE signed a second contract in 1990 to double LNG exports to Japan, and in 1994, a third LNG train at Das Island began operations to help fulfill the terms of the agreement. ConsumptionNatural gas consumption in the UAE reached a record high of more than 6.7 Bcf per day 2015.35 Solid economic growth and the resulting energy demand over the past few years are straining the country’s natural gas supplies. The UAE uses a large amount of natural gas in its extensive EOR operations and to operate its many power plants and desalinization plants. Meeting domestic demand will require large import volumes for the foreseeable future. Advances in EOR techniques and carbon capture and storage (CCS) could free up additional volumes for domestic consumption. State-led entities manage the domestic electricity grid in each of the seven emirates, but the UAE is working to integrate the Emirates into a more efficient national grid. This integration coincides with developing the Gulf Cooperation Council (GCC) Interconnection Grid that will link Bahrain, Kuwait, Oman, Qatar, Saudi Arabia, and the UAE under one regional grid. Data presented in the text are the most recent available as of March 21, 2017. 1International Monetary Fund, 2016 Article IV Consultation, July 2016. 3ADNOC, www.adnoc.ae, accessed January 2017. 4Dubai Supreme Council of Energy, www.dubaisce.gov.ae/en, accessed January 2017. 5Arab Oil and Gas Directory, “United Arab Emirates” pp. 514-554. 6Reuters, “ADNOC says “door is still open” for UAE oil concession talks,” April 4, 2016. 7Middle East Economic Survey, “Total Snags Stake in New UAE Onshore Concession,” volume 58, issue 5 (January 30, 2015). 8Reuters, “Japan’s Inpex wins 5 pct stake in new Abu Dhabi oil concession,” April 27, 2015. 9Middle East Economic Survey, “Abu Dhabi Reaffirms Output Hike Pledge as ADCO Stalemate Continues,” volume 58, issue 46 (November 13, 2015). 13Oil & Gas Journal, “Worldwide Look at Reserves and Production,” December 5, 2016. 14Arab Oil and Gas Directory, “United Arab Emirates,” p. 514. 15Oil & Gas Journal, “Worldwide Look at Reserves and Production,” December 5, 2016. 16Middle East Economic Survey, “ADNOC Creates New Crude Blend To Go On Sale From Next July,” volume 56, issue 46 (November 15, 2013). 17Middle East Economic Survey, “Abu Dhabi’s Oil Production Capacity Target Slips,” volume 57, issue 15 (April 11, 2014). 22OPEC Annual Statistical Bulletin 2016, Table 4.1. 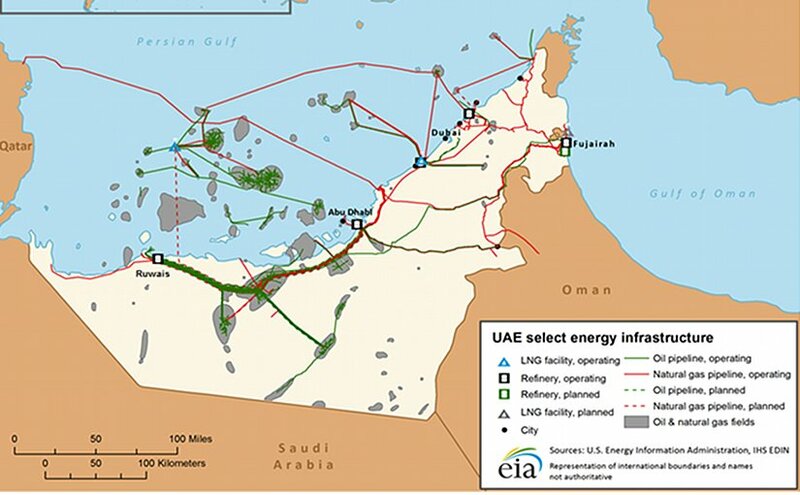 29IHS Connect, “Regasification Outlook: United Arab Emirates,” (August 26, 2015), accessed February 2017. 30IHS Energy, “United Arab Emirates LNG Market Profile,” (February 10, 2017), accessed February 2017. 32IHS Energy, “United Arab Emirates LNG Market Profile,” (February 10, 2017), accessed February 2017. 34IHS Energy, “United Arab Emirates LNG Market Profile,” (February 10, 2017), accessed February 2017. 36IHS Energy, “United Arab Emirates LNG Market Profile,” (February 10, 2017), accessed February 2017. 37Middle East Economic Survey, “Dubai Sets New PV Cost Benchmark In 800MW Phase Three Of Solar Park,” Volume 59, Issue 26 (July 1, 2016). 38UAE National Bureau of Statistics, Electricity Statistics (June 30, 2016) http://original.fcsa.gov.ae/EnglishHome/tabid/96/Default.aspx#refreshed, accessed February 2017. 43Middle East Economic Survey, “Dubai Sets New PV Cost Benchmark In 800MW Phase Three Of Solar Park,” Volume 59, Issue 26 (July 1, 2016). 44Middle East Economic Survey, “UAE Completes Nuclear Reactor Vessel,” Volume 59, Issue 30 (July 29, 2016).